Rajasthan Police Constable Recruitment 2018: Rajasthan Police Constable Bharti has released the notification for 13142 Constable posts. The organization has released the official notification on 25th May and the application process was also started on the same date. Interested and eligible aspirants waiting for Police Constable notification can apply before the last date, 16th June. In the notification, the last date for fee payment has also mentioned as 16th June. Hence there is less time left, candidates can apply fast. The online application for the post of constable will be accessible on Rajasthan Police Constable Bharti official website, police.rajasthan.gov.in. 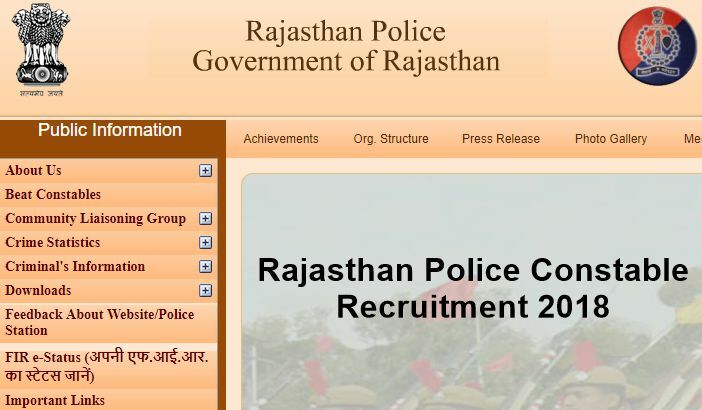 Candidates seeking to apply for Rajasthan Police Constable jobs can check further details such as eligibility criteria, application process, selection process, and other details from the following. Rajasthan Police Constable Bharti is the state level police recruitment board that issues various recruitment notifications. The Rajasthan Police Department has announced the notification for a large number of constable jobs this time. Applicants must have the minimum age limit of 18 years and the maximum age limit of 25 years. Candidates will be offered the age relaxation for reserved category. And coming to the educational qualification, candidates must have the minimum educational qualification of 12th class from any recognized board. Interested aspirants can check further details from the following. Name of the Post Constable. Number of Vacancies 13142 Jobs. Advertisement Release Date 25th May 2018. Starting Date of Online Application 25th May 2018. Closing Date of Online Application 16th June 2018. Last Date for Payment of Application Fees 16th June 2018. Release Date of Admit Card Notify Soon. Rajasthan Police Exam Date Updated Later. Candidates must have the minimum educational qualification of Plus 2/12th Class pass from any recognized board. Applicants must have the minimum age limit of 18 years and the maximum age limit of 25 years. Candidates will be offered the age relaxation for reserved category. How to Apply For Rajasthan Police Constable Jobs 2018? Click on Rajasthan Police Recruitment 2018. 3 How to Apply For Rajasthan Police Constable Jobs 2018?